Mano, M. Morris and Charles R. Kime. Logic and Computer Design Fundamentals, Third Edition. Prentice Hall, 2004. p. 73. 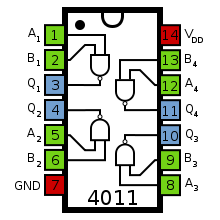 Steps to Derive XOR from NAND gate. NAND Gate, Demonstrate an interactive simulation of the NAND Gate circuit created with Teahlab's simulator.